Me? I’m all about paper. Any kind of paper: wrapping paper, tissue paper, candy wrappers, coffee filters, old maps, vintage books, foreign magazines, blue prints, dryer sheets, Monopoly money, craft scraps, postcards, damaged holiday decorations…I compulsively hoard save it. Joss paper is one of my favorites (see photo above, top right). Y’all just look at that! Isn’t it gorgeous? All saffron and gold and pink and wonderful. Lovely stuff. It’s also called ghost money or spirit money…people burn it as a way of worshiping ancestors and deities in traditional Chinese ceremonies and funerals (click here for a better explanation). Not only is it gorgeous, it’s super cheap: $5 for 500 sheets. Only downside to joss paper is that you need access to a good Asian market to get your hands on it. Hence, a wonderful excuse for a weekend excursion to Chinatown! Chinatown Chicago is about 10 square blocks, which is pretty puny compared to cities on the west coast, but man, it is really something you need to experience! The colors, the sounds, the SMELLS! It’s all packed in there like sardines; Chinese teas, rice paper lanterns, rotisserie duck by the dozen, herbal medicines, jade fountains, silk slippers, porcelain bibelots, wooden monkeys, firecrackers, golden piggy banks the size of toddlers, finger traps…My favorite store is an unabashed tourist trap. The walls are covered in silk robes and hundreds of lanterns and firecrackers hang from the ceiling. It’s like you died and went to live inside To Wong Foo, Thanks for everything Julie Newmar. Of course the restaurants are amazing too. 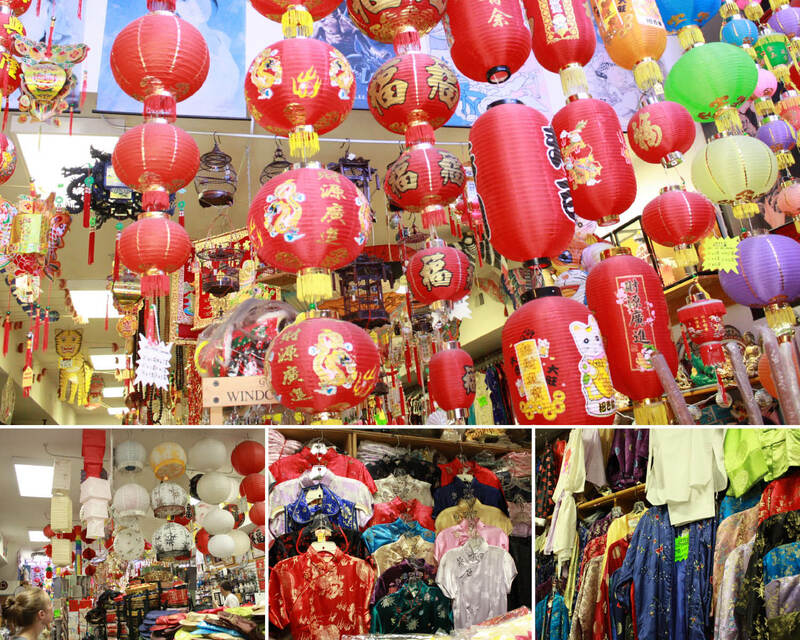 But Chinatown is a great place for more than just shopping and food –it’s a great way to expose yourself to something new and strange and wonderful. You know, shake things up! I admit, it’s slightly disorienting to be somewhere that doesn’t always print signs or price tags in English, but it’s also pretty nifty for someone like me who grew up thinking Panda Express was a cultural learning experience. Maybe I’m a hick, but everything in Chinatown seems so exotic and interesting. I can’t get enough of it. Chinese folks are crazy about dragons. I read somewhere that dragons are considered the “Governors of Rain” or something but I’m pretty sure it’s more than just that. Dragons are everywhere in Chinatown, even on top of all the light posts. This one shop sold the giant dragons they use in new years parades. You know, where 10 people line up under the body and dance in big swirling patterns. So cool! That one up on the left, which is actually a lion, was priced at $139. Pretty incredible when you consider the time it took to create it! If I had a grand staircase or 2 story ceilings, I would love to hang one of those dragons mid air. Wouldn’t that be awesome? It would scare the crap out of Lola, but dang, it sure would be cool! There are several stores devoted to herbal medicine, including one that sells ginko in barrels (above right), and there on the top left, can you read the label on the jar of dirty looking worms? It says: CORDYCEPS: $1055.00 PER TEAL =1.33oz . 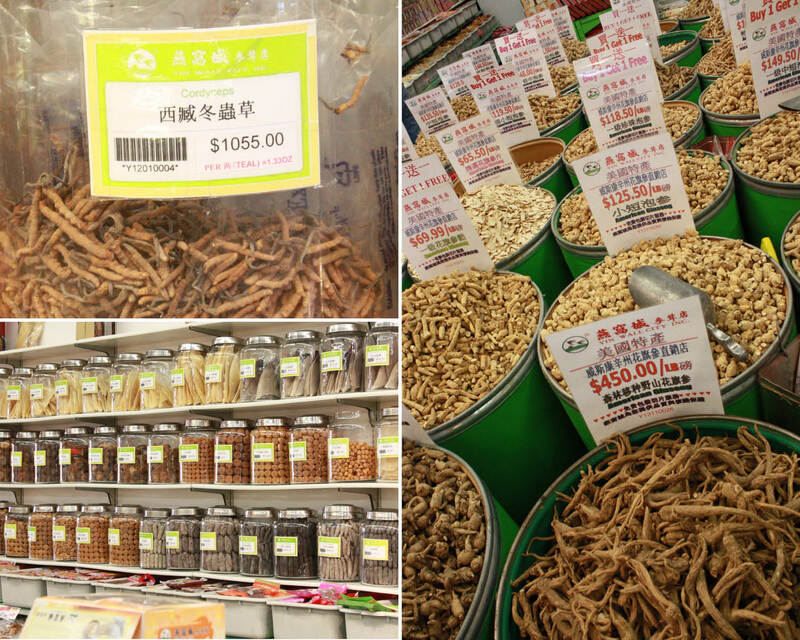 #2 How do I get in the cordyceps growing business?! 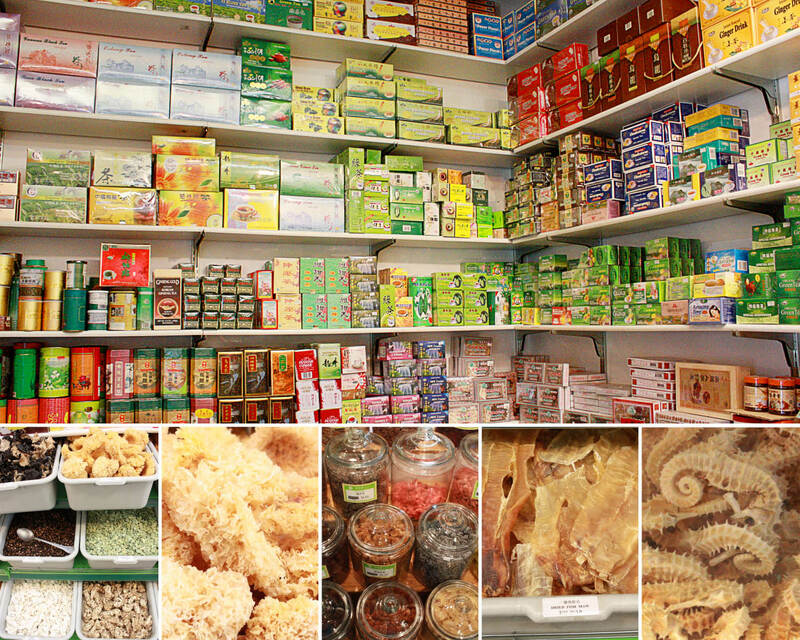 And then there is the exotic grocery store that sells flaked eel and dried sea horses (above photo, lower right). That top photo is just the green tea section! Cheap household goods with the MADE IN CHINA seal on the bottom take on a whole new meaning here. 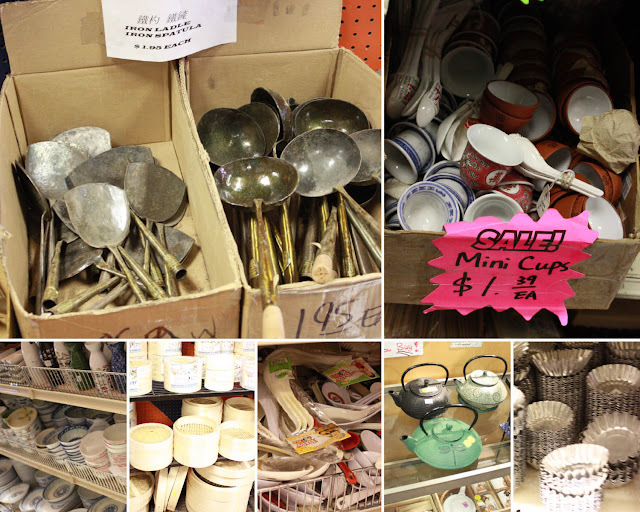 Just look at those spatulas and ladles marked at $1.95! And the most gorgeous dishes and tea sets priced at next to nothing. I really don’t have the need or space for anything, but gosh, it’s fun to look. Those little aluminum dumpling tins on the bottom right were something like 20cents a piece? Let me tell you, it took a lot of restraint for me to avoid buying a dozen for a TBD art project…but the last thing I need is more stuff to store. Got to keep my hoarding storage situation in check. Still managed to sneak away with a few odds and ends, including a lantern revamp I’ll post tomorrow, but I have a feeling I’ll be coming back for those dumpling dishes real soon! Stunning pictures! 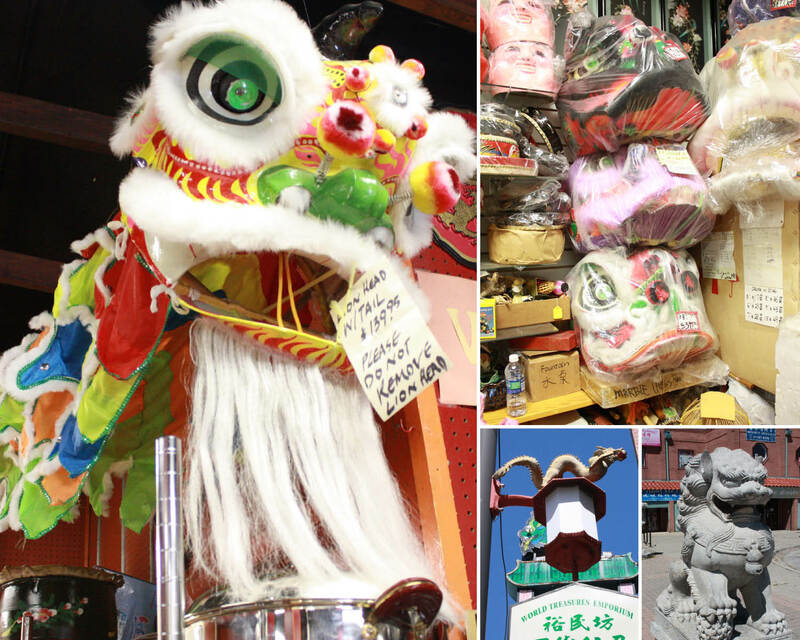 I am coveting that dragon head! Can’t wait to see your lantern. We are SO kindred on the paper thing!!! I sometimes feel like I have a little addiction on my hands, glad to have someone who shares my love! This post hauled in a follower… I am fascinated. There are loadsa chinese folks over here in Leeds, England (and not too few chinese supermarkets, we are blessed),but no Chinatown yet. Here’s hoping! 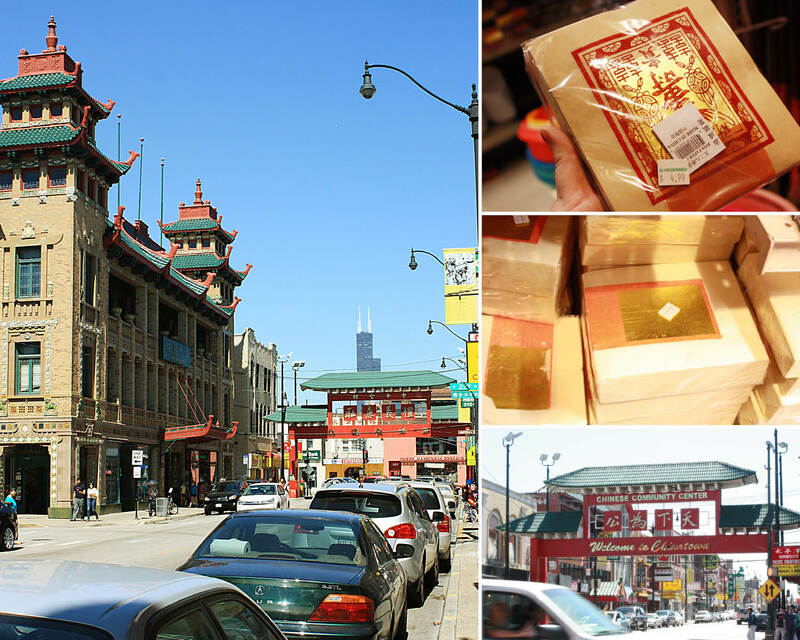 i miss chicago’s china town so much! the gate is so fantastic…..the BEST italian place is tucked in there but i’ve been sworn to secrecy so as not to have it be ‘discovered’….. This makes me want to be a country mouse in the city.